Johachidolite is an exceptionally rare gem material that became available nearly a decade ago. The finds around Mogok, Burma produced quite a few stones in the lower ranges of quality - there was always quite a dearth of stones that showcase both fine color and clarity. 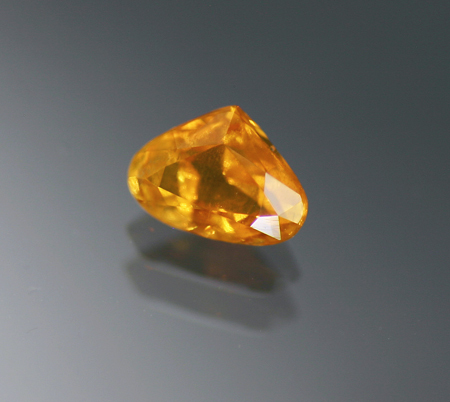 This was particularly true of stones of any significant size - say, more than 0.15 ct. Now that this find has dried up entirely, the lack of truly fine pieces is even more acute. This remarkable stone, the largest of the species we have ever offered, features the absolute top color - a bright and quite intense orange. There are a few low relief veils but nothing distracting at all; considering the huge size for the species and the color, this is one of the very best Johachidolites we have ever seen. A remarkable rarity.